The inspiration for this recipe came about because often, after Easter, we have an abundance of leftover tsoureki bread, so I started making bread and butter pudding. This dish is my take on French toast, using these fragrant Easter loaves. Tsoureki is now available from supermarkets all year round. Petimezi is a wonderful ingredient, made with grape must, available from Greek delis. Lay the tsoureki in one layer in a large glass baking dish. Whisk the eggs and milk together with the cinnamon and sugar. Pour this eggy mixture over the bread. Ensure the bread is completely covered. Allow to soak in until it is well absorbed. Melt some butter in a frying pan over medium heat. Once it has started to froth, add two pieces of soaked tsoureki. Cook gently until the bottom of the bread has a beautiful golden crust. Turn over and repeat on the other side. Repeat with all of the soaked tsoureki. Keep the cooked slices in a warm oven on a tray lined with baking paper. To assemble, lay a slice of tsoureki on a plate for each person and pile some ricotta on it, then drizzle generously with petimezi. Sprinkle with a pinch of cinnamon then some pomegranate seeds. 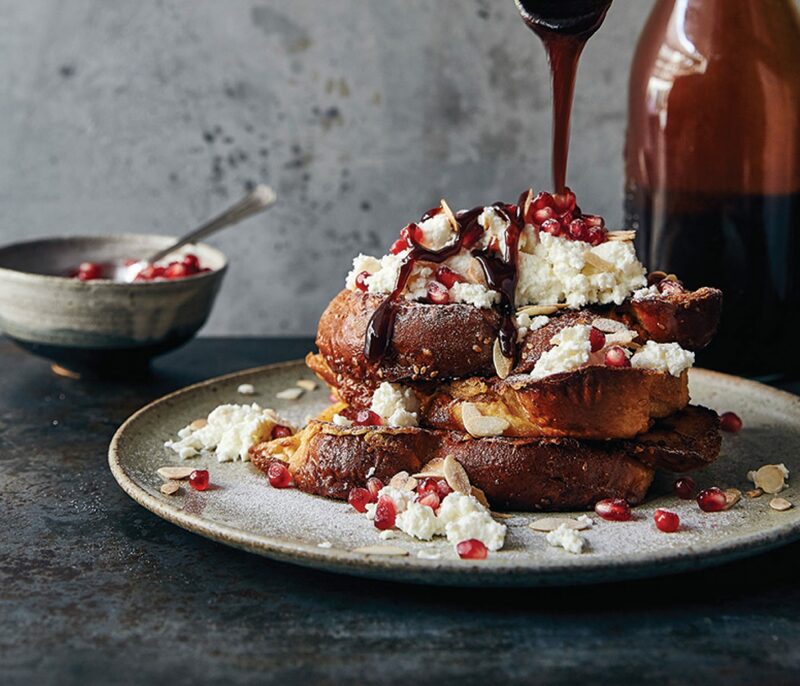 Add another slice of tsoureki and repeat with the ricotta, cinnamon, pomegranate seeds, and a drizzle of the petimezi so that it runs down the sides. Generously sprinkle with the toasted flaked almonds and finish with a dusting of icing sugar.